31 Day Challenge - Polish This! 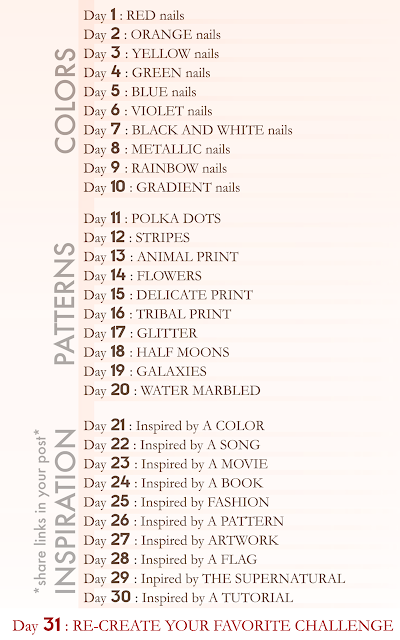 I am very busy right now with my shop, so I have to pass on this challenge, but I am very curious what you make of it! Wow! I don't know if I could commit to daily polishing, but I'd give it a try! Looks like I'll be joining you and Wacky Laki in this challenge! Seems like fun! @Ash-Lilly: You can go your own pace, like I'm gonna do. Can't wait to see your challenge manicures! this looks like so much fun. I'm doing it!! @Kate my Mate: Glad you're joining in too, can't wait to see your manis!